The research is original and important to the field of Medicine. Not necessarily original research, e.g. an original approach to a topic, or a review of an area that has not been extensively reviewed in the existing literature. 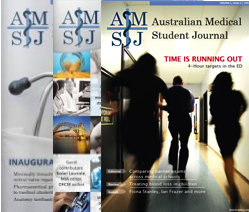 The research content is of interest to the medical student readers. The content is reasonably broad in scope (as opposed to extremely specific topics that would only be of interest to specialists in particular field). Address topics that would typically not be covered in core medical curricula. The introduction effectively introduces the problem investigated with clear objectives and an appropriate critique of relevant literature. The study design, methodology and data analysis are sound and appropriate in effectively addressing the aims/questions of this study. The research findings have been presented in a logical concise manner, and the interpretations and conclusions derived from such findings are justifiable. References are adequate in number, relevant to the study, and up-to-date. The study follows appropriate guidelines (i.e. those from EQUATOR). The study is well written in standard English. Each issue will attempt to strike a balance between more scholarly and more general-interest articles. Furthermore, each issue will aim to include articles spanning a diverse range of fields.